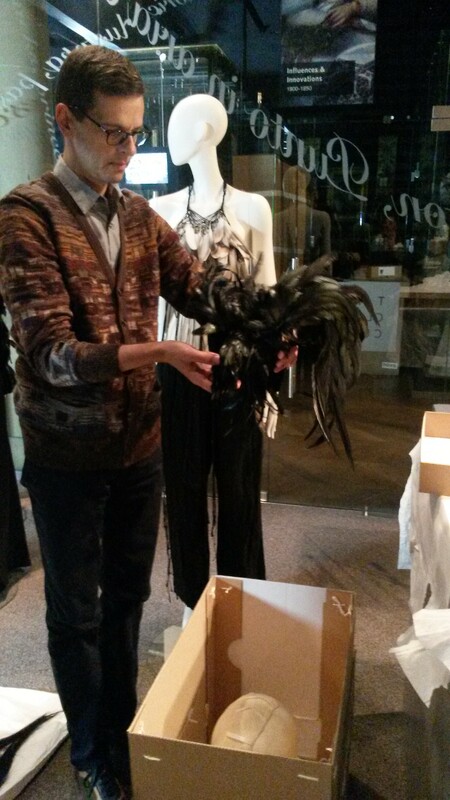 In the lead up to the opening of ‘Birds of Paradise: Plumes and Feathers in Fashion’ we thought it would be interesting to go behind the scenes with Wim Mertens, Curator of the Collections at MoMu who arrived on Monday to install the exhibition. The exhibition was on show at Antwerp’s Fashion Musuem, MoMu from March to August, and since closing in Antwerp the fantastic designer dresses, feather accessories, hats and shoes have been carefully packed and shipped to Barnard Castle ready for installation and opening on Saturday 25th October. 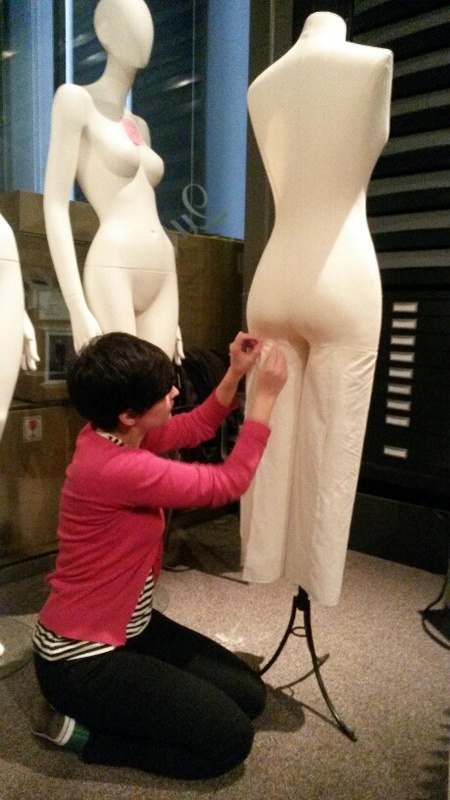 Before the mannequins can be dressed, there is a considerable amount of work to be done to them to create the shape of a real body underneath the clothes. 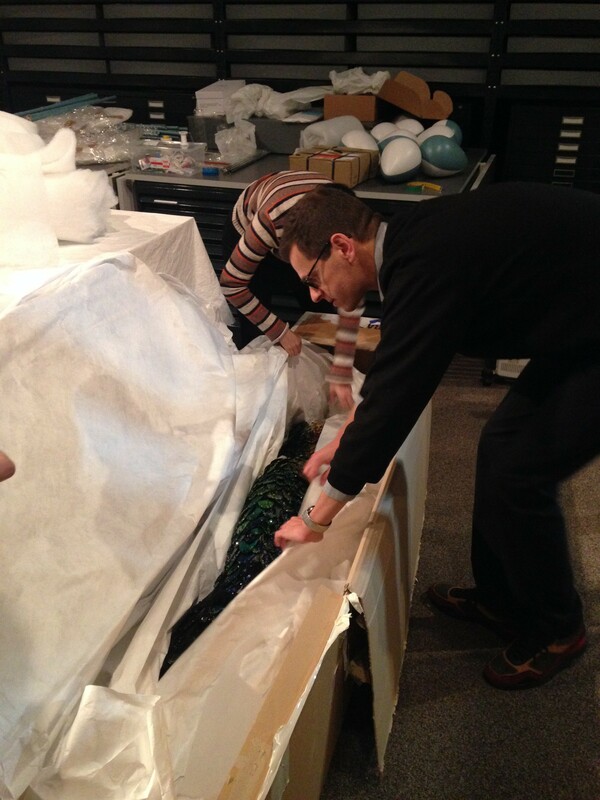 To help Wim with this important preparation work, two of the Museum’s Textile Conservation interns, Maria and Emily are sewing tulle netting to the bottom of the busts, to create the structure, covered by a second layer of soft cotton sewn in place to avoid the coarseness of the netting damaging the costumes. 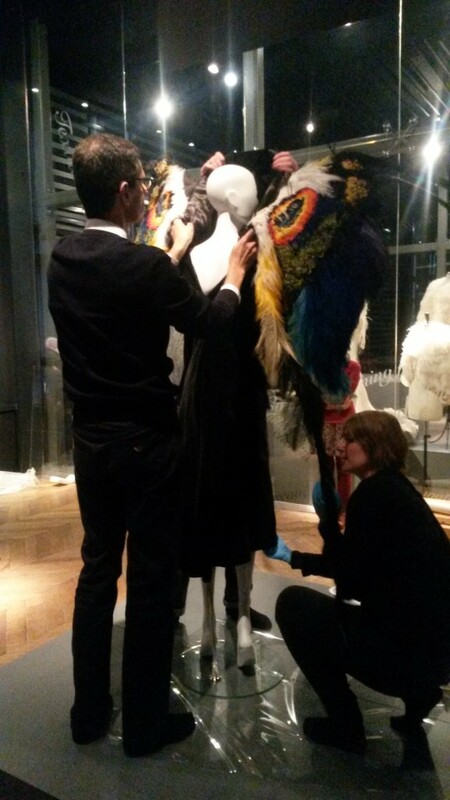 Creating the impression of something underneath the costumes, making the mannequins ‘come alive’ is even more important with the dresses adorned with feathers, as feathers add a playful and elegant dimension to the costumes. The idea is to try to create a sense of movement and flexibility and the impression that the dresses are being worn by ‘real’ models. As well as legs for trousers, and extended bodies for skirts, arm-like structures can be added to the shoulders of the busts to add volume to the sleeves. Wim, Maria and Emily are working in the Glass Cube in the Fashion & Textile Gallery, which is temporarily closed to visitors. 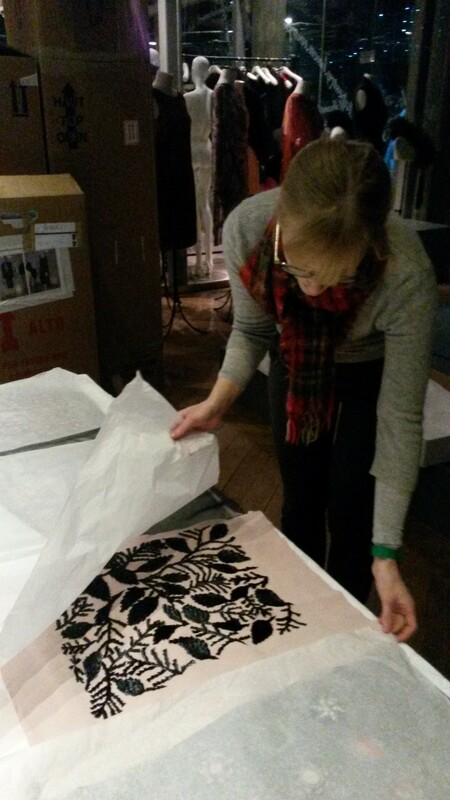 Hannah, our new Assistant Curator of Fashion & Textiles and Joanna, Keeper of Fashion & Textiles are busy in the Gallery preparing the display cases for some of the costumes and, as it’s all hands on deck to get the installation finished on time, they are being ably-assisted by volunteers. 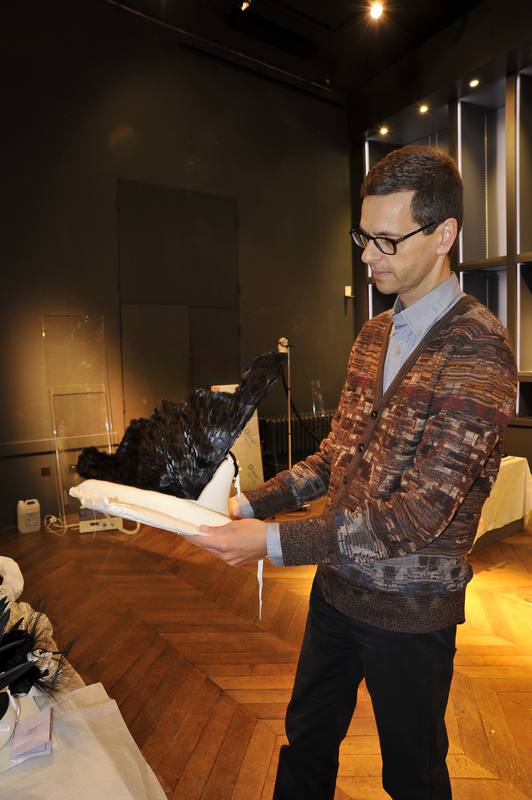 Hannah gave me an exclusive peek at the samples of feather work which have been made especially for the exhibition by Parisian design house, Maison Lemarié, one of the last of its kind, specialising in the art of the plumassier. 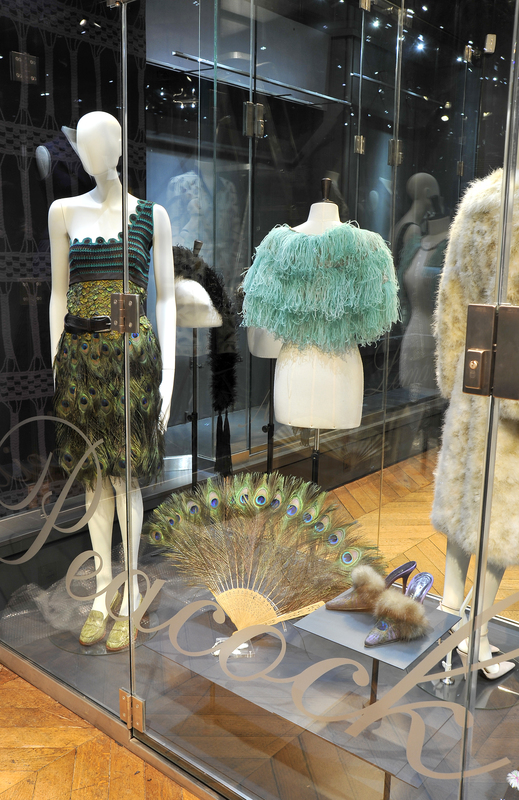 This fashion house has specialised in processing plumes, primarily for French Haute Couture, since 1880. 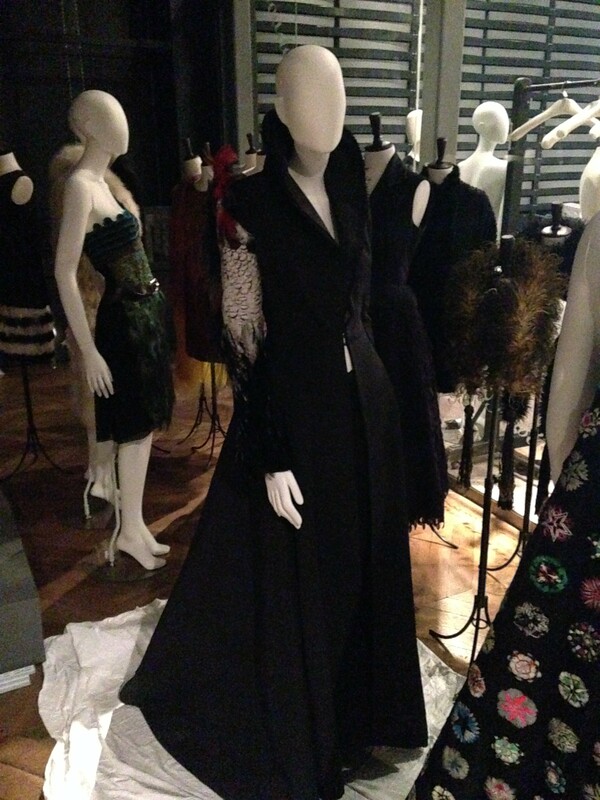 From the small glimpse I had, the samples look truly beautiful and reflect some of the feather work on the dress by Dior from its Haute Couture 2013 collection, which I was lucky enough to witness Wim unpacking. 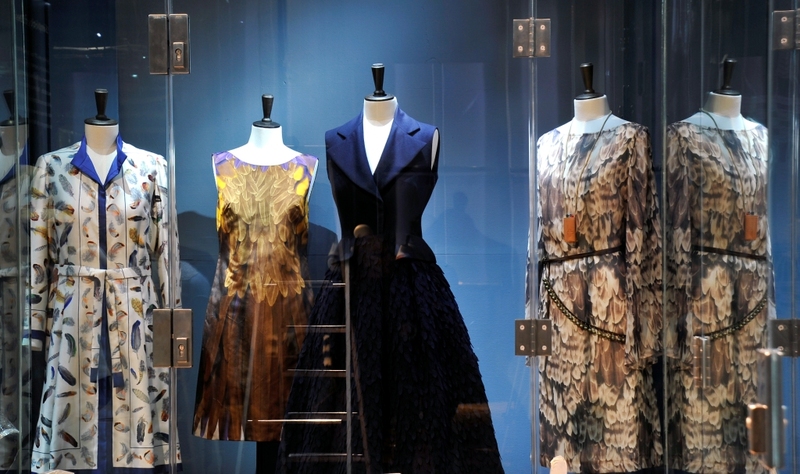 From first impressions, this fashion exhibition is going to be breath-taking. Yesterday saw Maria and Emily finish preparing the small mannequins/busts so they are all dressed, and start on the full mannequins. 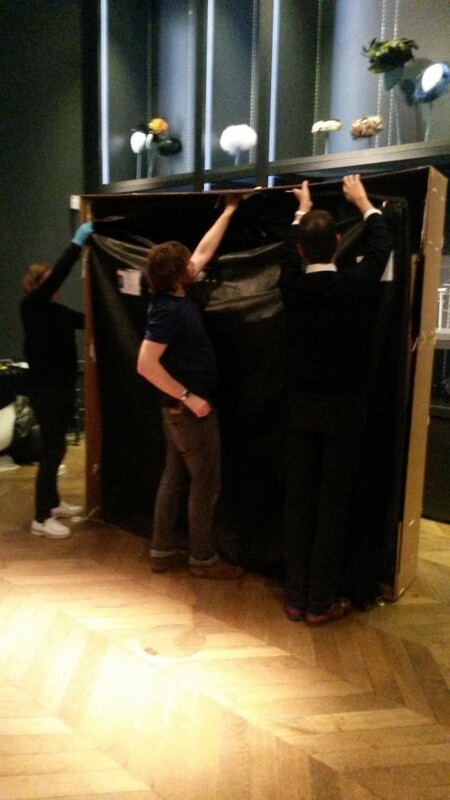 This morning was the unpacking of a glorious creation nicknamed the ‘beast’, who will be greeting visitors in the English Interior Gallery. Her real name is Chimera, who was, according to Greek mythology, a monstrous fire-breathing female creature, part animal, part snake. 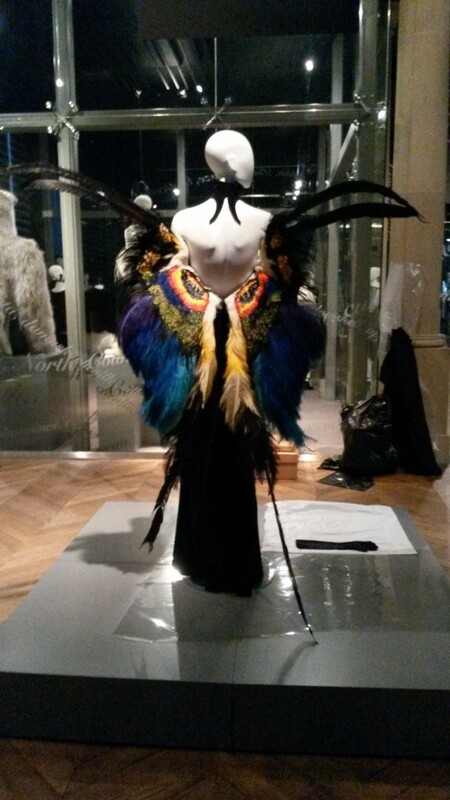 Designed by the French Couturier, Thierry Mugler, this elegant ‘creature’ consists of a fantastical animal skin; the bodice in thermally shaped synthetic scales (by Jean-Jacques Hurcun) is embellished with ostrich feathers, sequins, rhinestones, horsehair and bead embroidery (by Mr Pearl who is known for his obsession with corsets), while the headdress is comprised of dyed swan and goose feathers, sequins and beads (by Eric Haley). This stunning dress is so heavy that it takes more than 1 person to lift it. 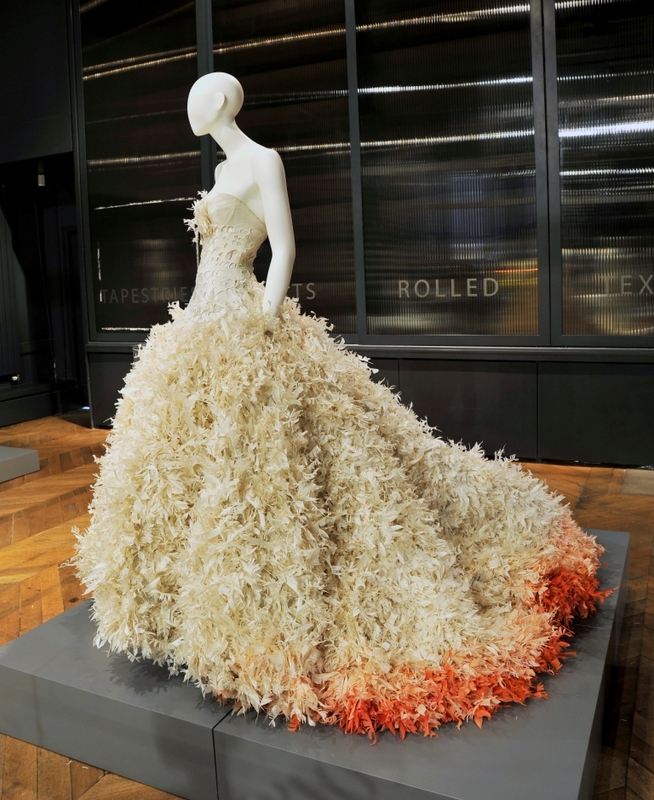 One model had the privilege, or the misfortune, depending on how you look at it, to show this dress on the catwalk. It took a machine to lift them onto the stage, where she was unable to walk so stood looking amazing but hardly able to breathe! 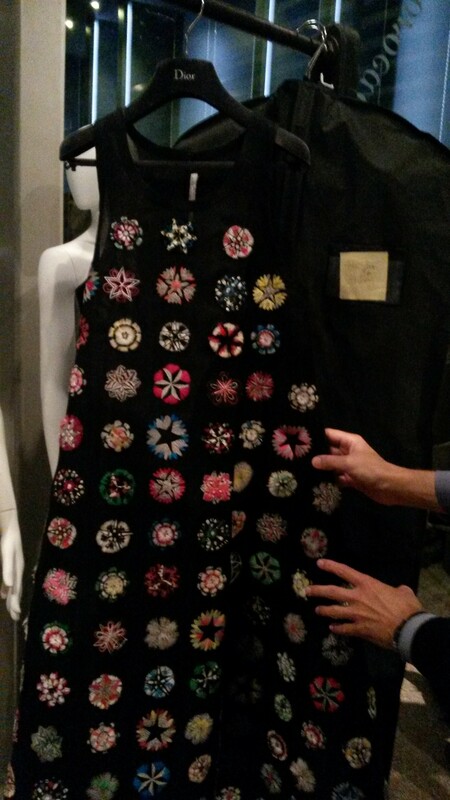 Later today or early tomorrow sees the unveiling of the impressive dress by Olivier Theskens for Rochas. A white replica of the blue version worn by actress Nicole Kidman at a red carpet event, we are not sure how she managed to get to said event as it would certainly not fit in a car, anyone have any ideas? Wim spent yesterday dressing three full mannequins with outfits by Ann Demeulemeester, a fashion designer whose eponymous label is mainly showcased at the annual Paris Fashion Week. 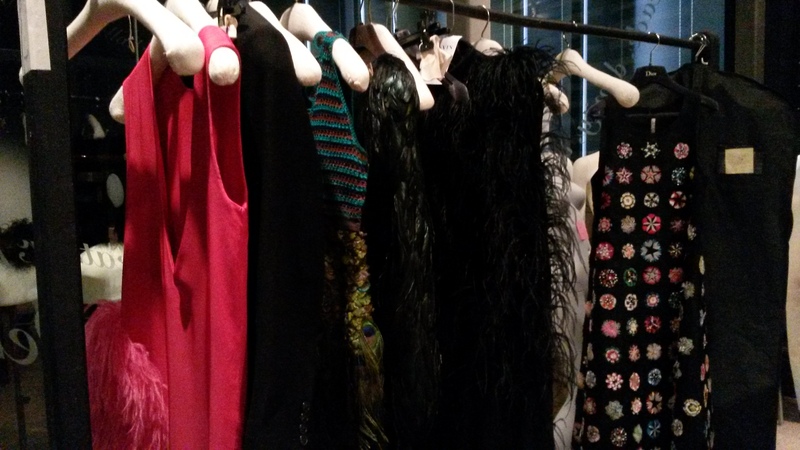 Along with Dries Van Noten she is known in the fashion industry as one of the ‘Antwerp Six’. 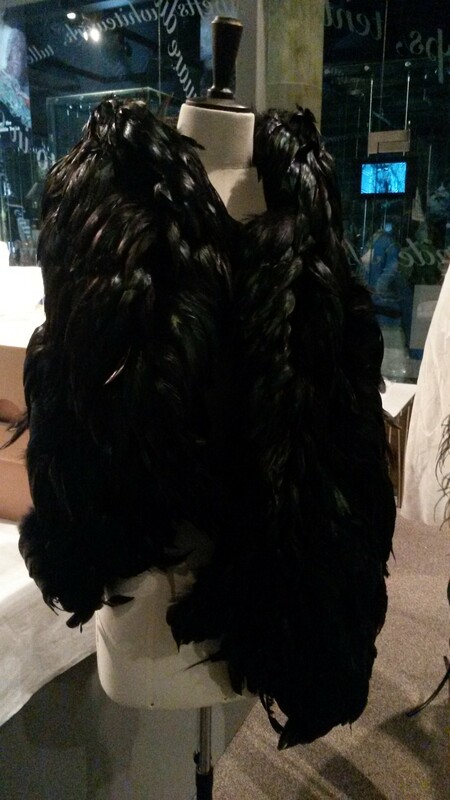 Her first collection appeared in Paris in 1991 featuring outfits showcasing feathers from pigeons, roosters and crows. Her intention was to elevate the status of these birds to something more interesting and note-worthy. Ann considers the use of feathers to have a poetic nature, referencing themes from 19th century French poetry such as freedom, liberty and the opportunity to ‘fly away’. Ann believes that there is an incredible perfection to feathers, and there is no way of imitating them. Often her designs combine elements of both masculinity and femininity, seen in the costume from her Autumn/Winter 2011-12 collection using crows’ feathers with references to an ammunition belt. 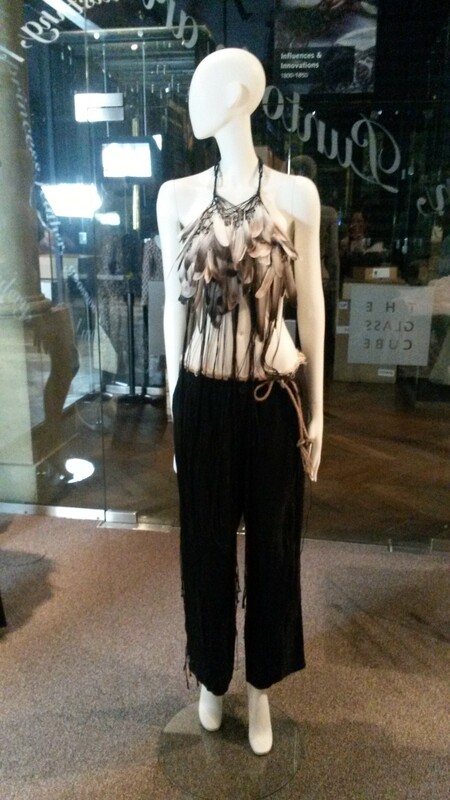 Another costume uses rooster feathers to decorate a waistcoat, an item of clothing usually associated with men, but teamed with an elegant, fine leather skirt, creating a more feminine feel. 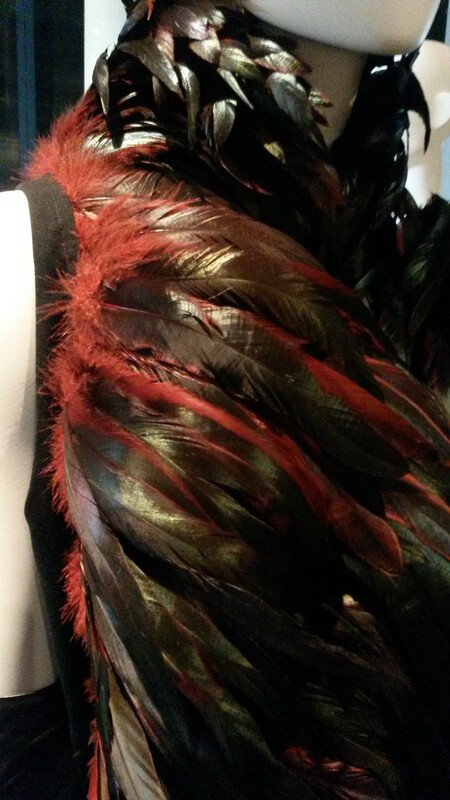 The rooster feathers are black with a natural green sheen, dyed with red to create a gradient of colour and almost iridescence. 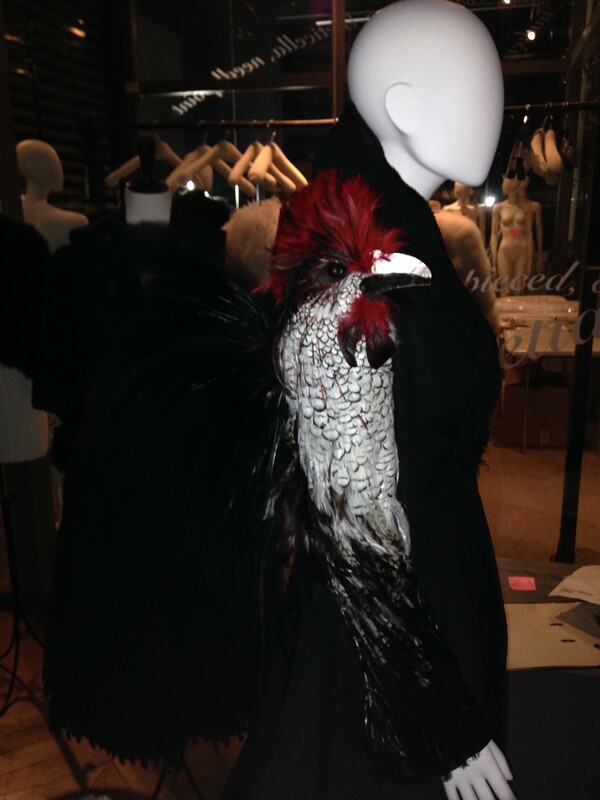 The three full costumes by Ann Demeulemeester will be accompanied by a headdress made of rooster feathers designed by her, and a black waistcoat made of rooster feathers tinged with green. The headdress was worn by P J Harvey, an English musician, singer-songwriter, poet, composer and occasional artist. Wim explained that although the waistcoat made of rooster feathers is designed to look like you can just ‘throw it on’ and wear it in a ‘playful style, Ann is actually very particular about the way her clothes are worn. During the exhibition, a film will be playing of Ann Demeulemeester’s Autumn/Winter 2010-2011 collection, along with music by P J Harvey. Friday saw the installation of the first mannequins in the showcases (on the right hand side for those of you who know the gallery). These three dresses represent what is known as trompe-l’oeil – a trick of the eye to make the feathers on these dresses appear real. 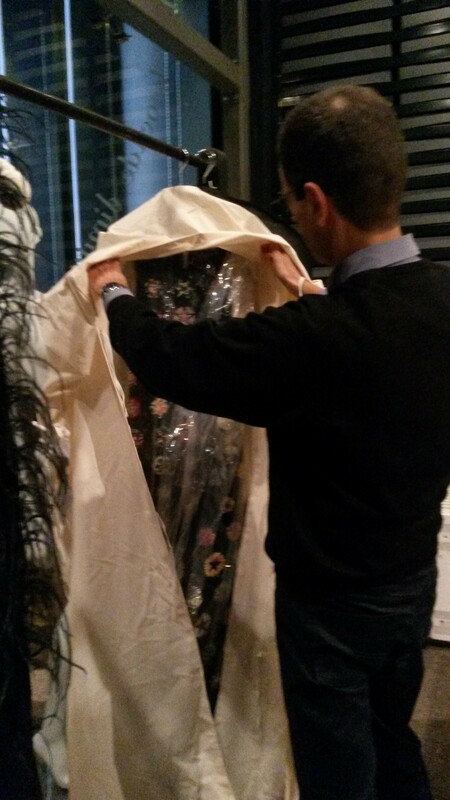 Other dresses which have now been mounted include the Nina Ricci currently residing in the glass cube and which featured in the recent documentary on Anna Wintour, Editor of American Vogue. 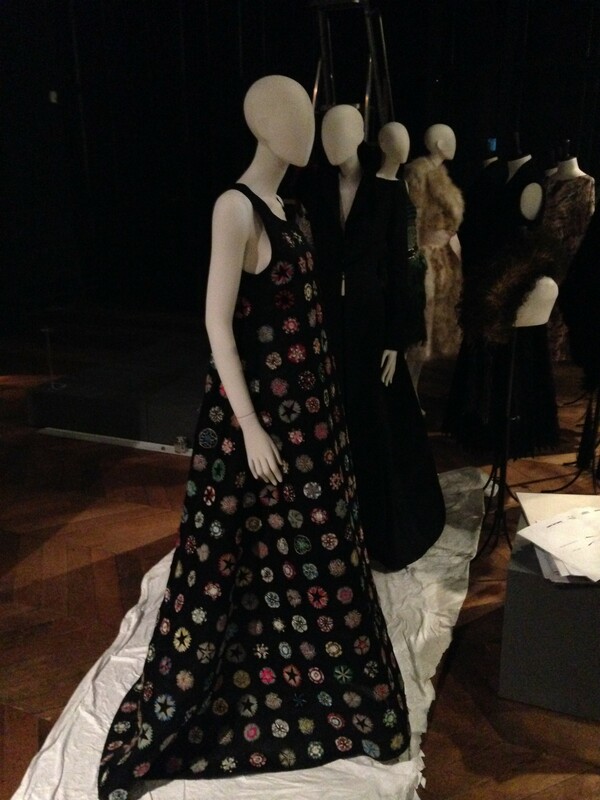 And, as promised, the dress by Olivier Theskens for Rochas looks as stunning as we thought it would. Robby Timmermans has arrived, Momu’s production manager. 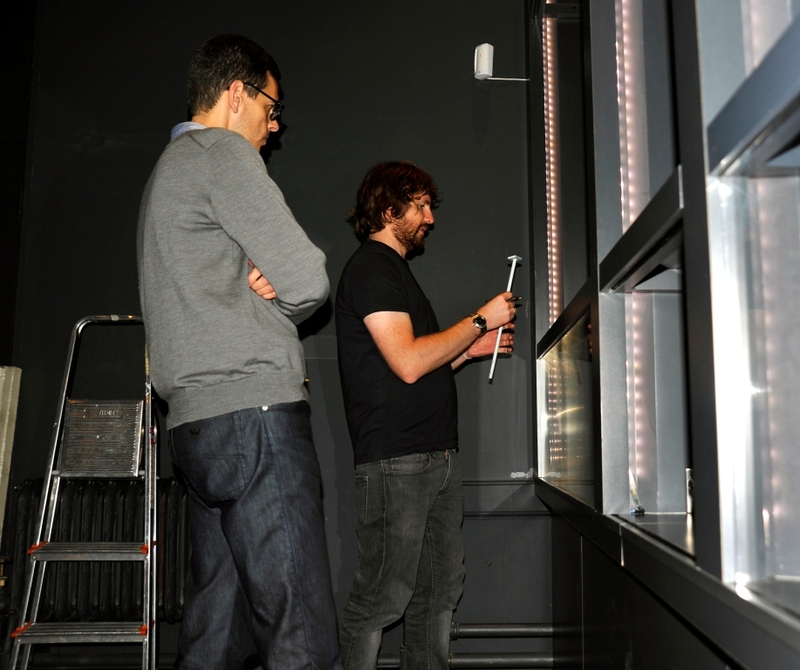 He is responsible for the staging of the exhibition and is busy at work starting on the major display of all the accessories. All in all we can safely say it is all coming together wonderfully, what an exhibition it is going to be. Roll on opening night! 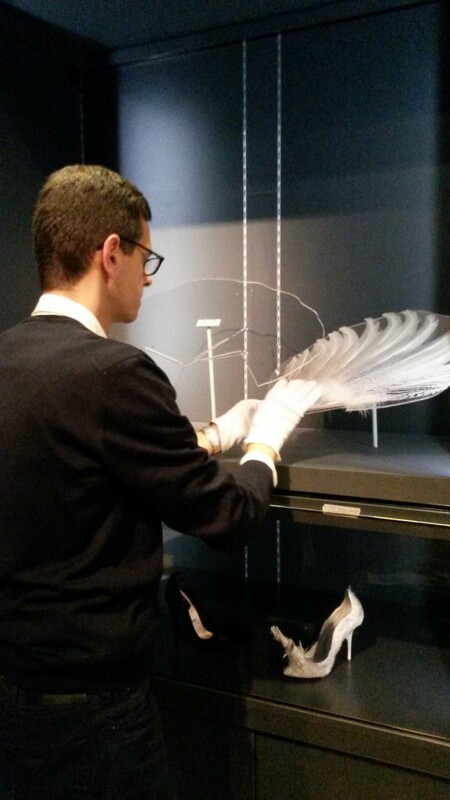 Yesterday saw the near completion of another case dedicated to Peacocks; the only accessory now awaited is the milliner Stephen Jones’ hat made from peacock feathers, which was designed for Liberty in London. This display of the exotic bird feathers can lead to several layers of interpretation; with the symbol of pride and the connotations of luxury and elegance. Moving to the hats section of the exhibition, there are numerous from the MoMu collection ready for display in the major showcase. 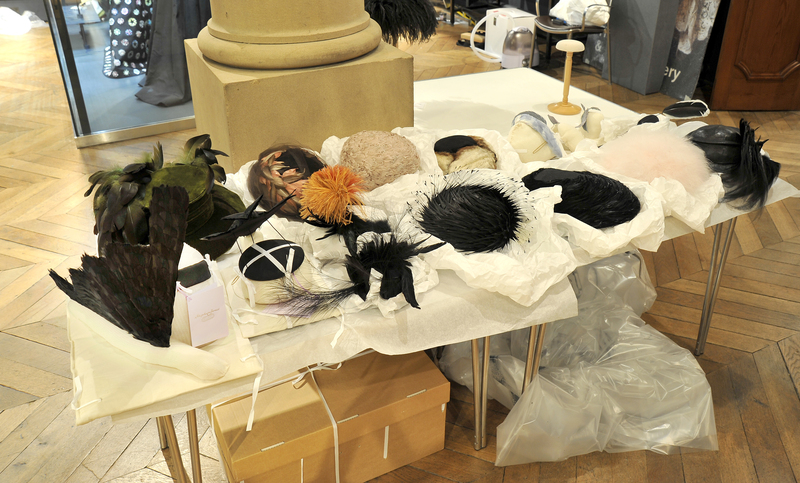 Two of the hats included in this display are completely new to the show and loaned via Stephen Jones. 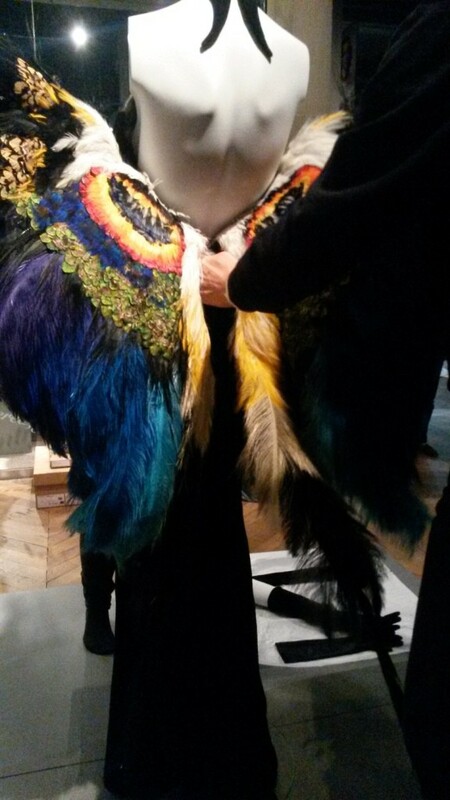 They are based on aeroplanes, using feathers as part of the design. 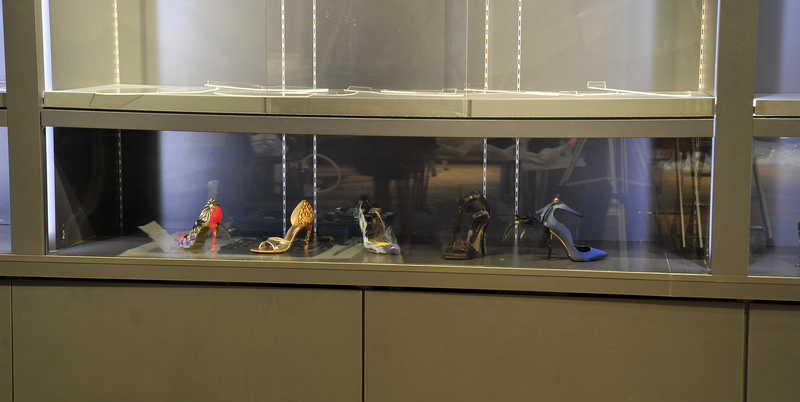 Robby continues to work on the setting of these showcases so all accessories are shown to their full potential. 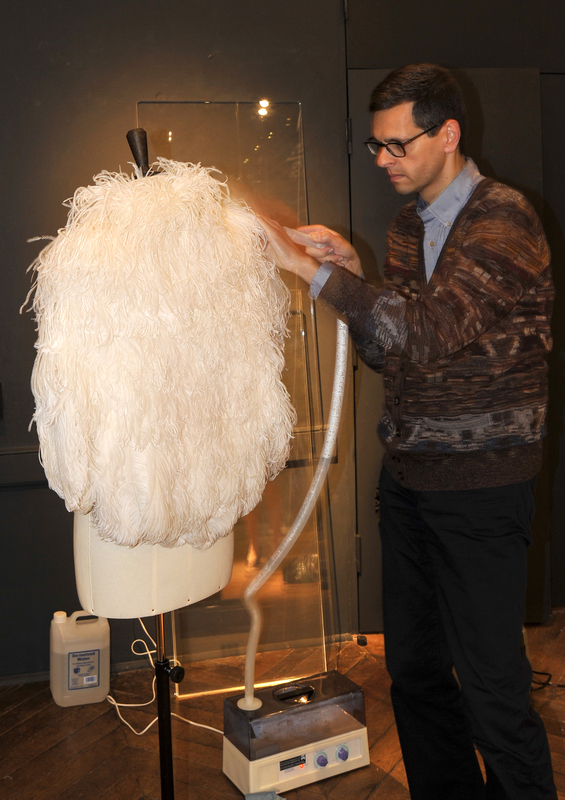 Today sees more dresses being prepared for display; this means humidifying the soft part of the feathers known as the beard, giving them volume. Imagine blow-drying hair. . . well this task is done exactly the same with steam instead of hot air! 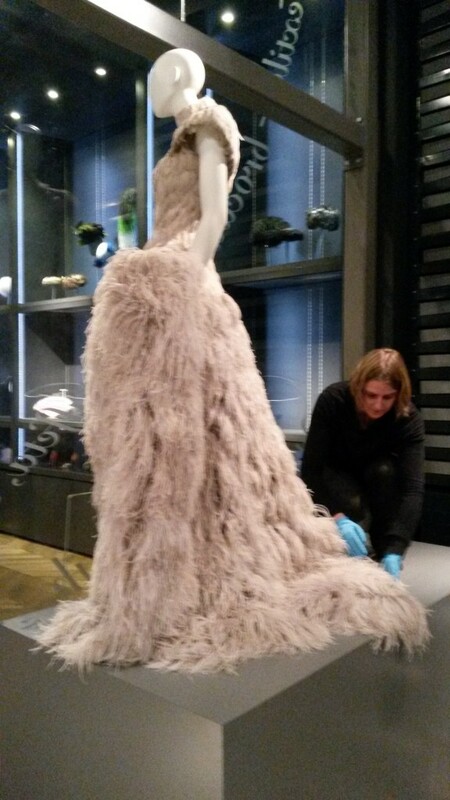 The feathers need fluffing and dampening so they reshape allowing the dresses to look as good as new. Having not been to the Fashion & Textiles Gallery since my last blog on Friday, when I arrived there this morning the transformation was incredible. 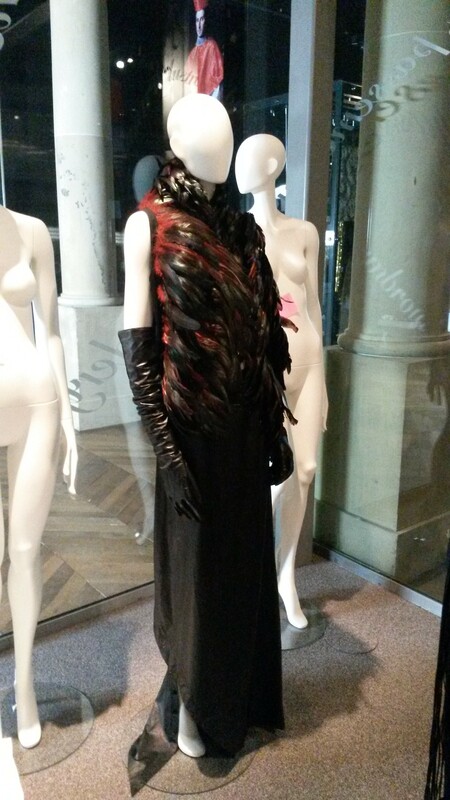 The team, which is growing by the minute, dressed a mannequin with the Alexander McQueen gown yesterday, and today it was lifted up onto a plinth in the Glass Cube to make it one of the first costumes you’ll see on entering the Gallery. 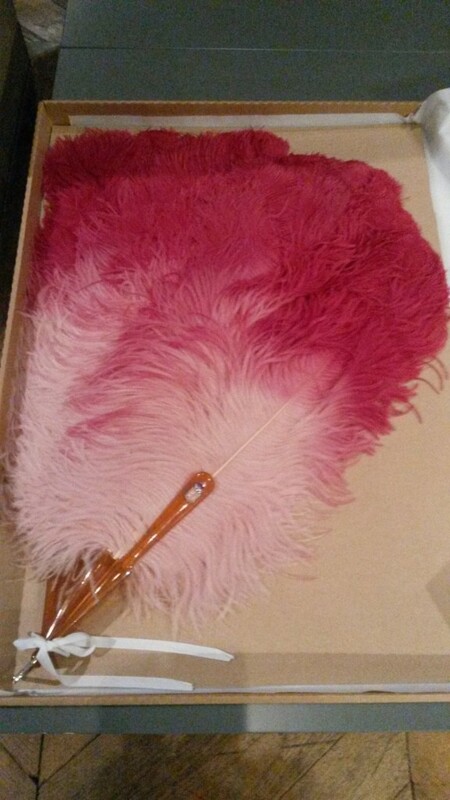 On the main showcase wall in between the shoes and hats, there will be a display of feather fans. Wim unpacked three to show me how he handles them with the utmost care and gently fans them into position on their acrylic mounts in the cases. The first he showed me is an historical asymmetrical fan from MoMu’s collection, made of Lady Amhurst pheasant feathers, dated c. 1890-1900. 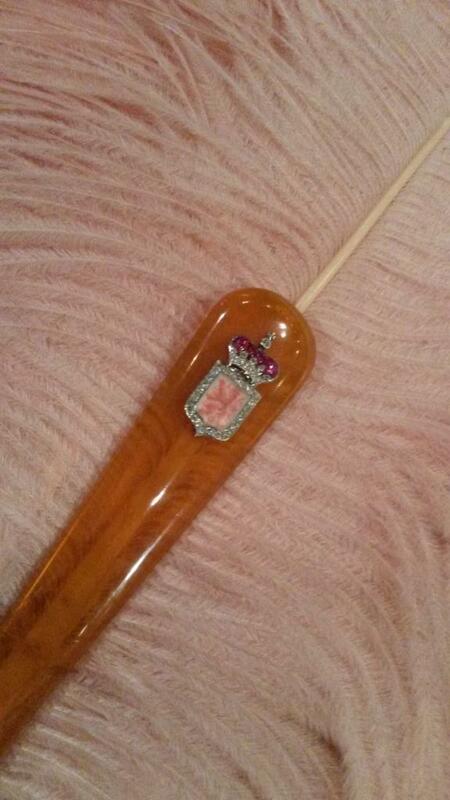 The second and third were from the Royal Collection and usually reside in the Royal Palace of Belgium. 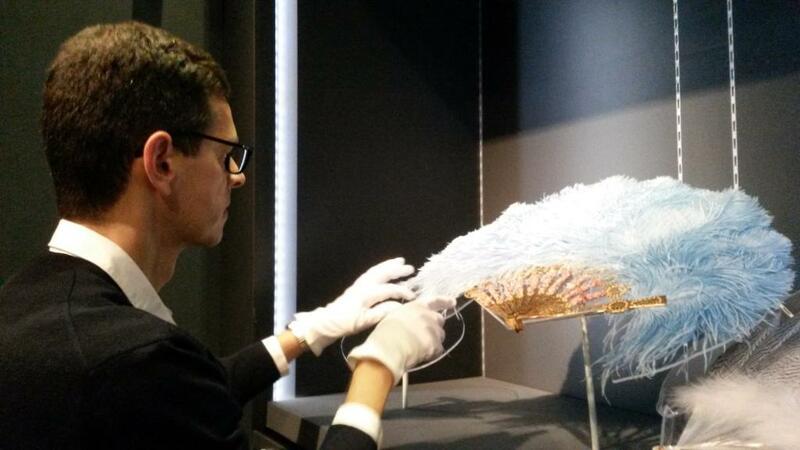 There was a fabulous blue one, which Wim fanned out and displayed, and another in beautiful pink ostrich feathers which was an engagement gift to Queen Astrid of Belgium in 1928 from the Province of Limburg. You can just make out the tiny royal coat of arms in the photograph. 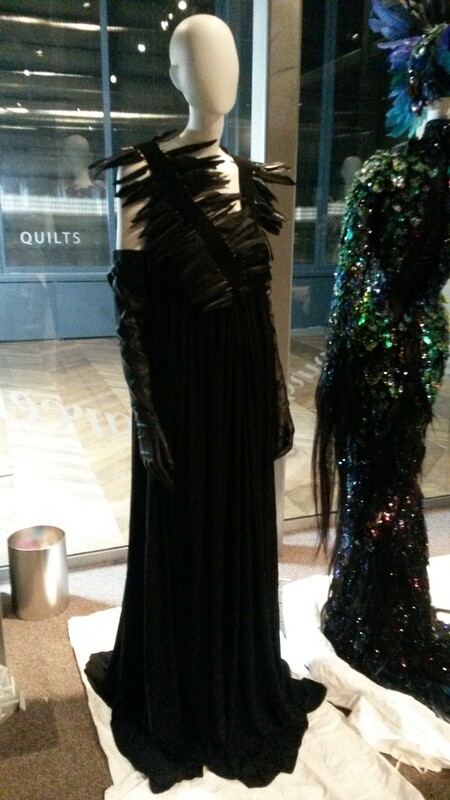 The ‘beast’ by Thierry Mugler which Rachael included in her blog on Thursday 16th was next installed in the English Interiors Gallery to greet and wow visitors en route to Fashion & Textiles. 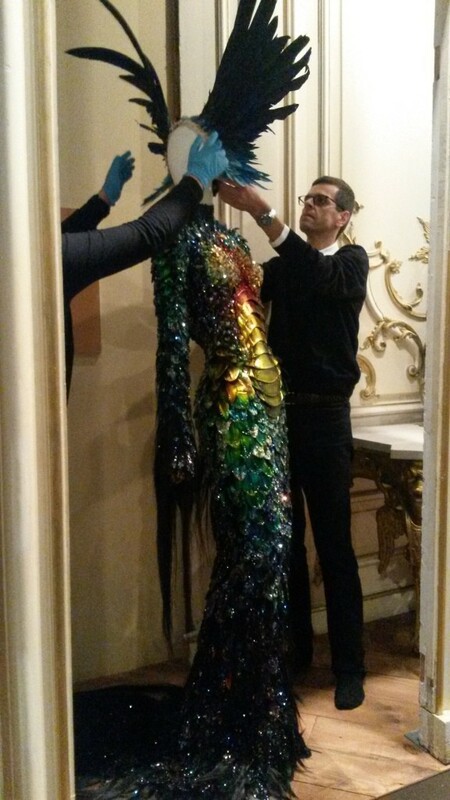 Although there will be finishing touches added to the Galley tomorrow morning before the preview, and then opening to the public on Saturday, Wim thought it would be a fitting conclusion to the blog to feature the unpacking of the ‘butterfly dress’ by Thierry Mugler which has been one of our signature images for the show. Taking it out of the huge box it arrived in, was a three-man job with Robby’s wife, Griet giving Wim and Robby a helping hand. The dress by Mugler signifies the blossoming beauty of a woman, as she undergoes a metamorphosis from a woman to a butterfly. It’s from Mugler’s Haute Couture Spring Summer 97 collection and it is very special as it is made by the Parisian plummasier Maison Lemarié. Once safely installed on a mannequin on the first plinth as you enter the Gallery, it really made a breath-taking fashion statement. 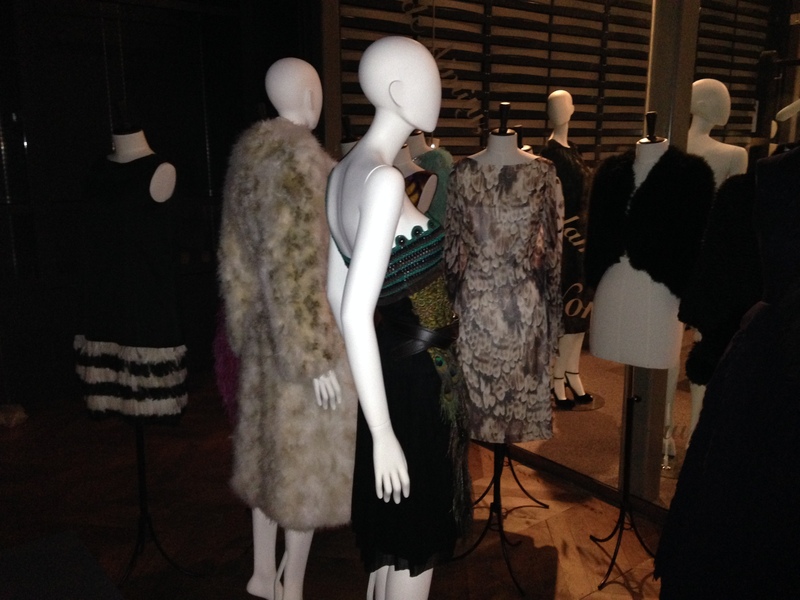 As a last glance ‘behind the scenes’ Wim explained how the dresses are grouped by themes, the soft white dresses in the Glass Cube portraying innocence, contrasted by the black Demeulemeester outfits beyond the Cube highlighting the darker side of feathers and plumes. Lost innocence, aggression, luxury and romance are just some of the alluring themes waiting to be explored by you.